BEND, OR -- Two men were arrested early Monday morning, suspected of stealing a car and several items from two southeast Bend businesses. According to police, the men stole a pickup from the Moose Lodge parking lot on South Highway 97 then drove to the neighboring Goodyear Auto Care and loaded a number of tires and other automotive items into the truck. Police stopped the stolen truck and arrested 48-year-old Troy Nielson of Madras. 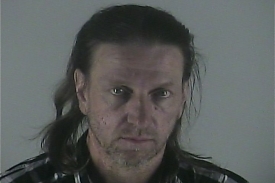 After a separate traffic stop, 48-year-old Daniel Webb of Bend (pictured) was arrested allegedly in possession of burglary tools.